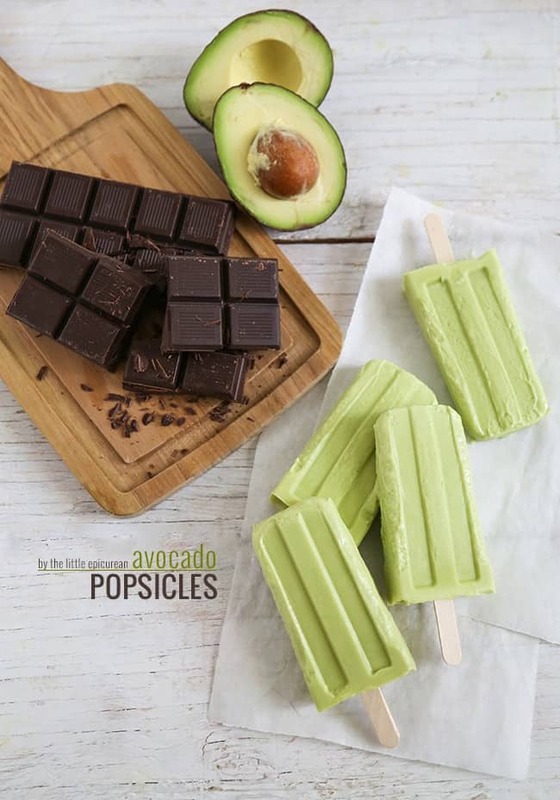 Fans of ice cream will love these creamy chocolate avocado popsicles! They’re rich and decadent and such a fun treat. Growing up, my dad taught me all sorts of things: how to tie my shoes, the multiplication table, and how to eat avocados. Once in a while on weekend mornings, my dad and I would enjoy breakfast together. Whenever he could find avocados, he’d make me this special breakfast. He would place chopped avocados in a bowl, drizzle a little sweetened condensed milk on top, and then add milk. It was creamy, sweet, and oh-so-delicious. I thought everyone ate avocados with milk. It wasn’t until college when I lived with roommates that I learned it wasn’t so common. I’ve made a frozen ice pop version of my dad’s beloved breakfast avocados. It has all the same components, except I blended everything together and poured the mixture in to popsicle molds. I find it much easier to eat it this way, plus I can keep the avocado popsicles in the freezer to have on hand whenever I’m feigning a sweet treat. Gather 3 ripe avocados, 1 1/2 cups milk, and 4 tablespoons sweetened condensed milk. Puree all the ingredients together using a blender or food processor. Adjust thickness and sweetness accordingly. I prefer to keep it thick and creamy, so it ends up like rich ice cream. Pour mixture into popsicle molds. Insert wooden sticks and freeze for at least 3 hours until popsicles are solid. At this point, the avocado popsicles are ready to eat. However, for added decadence, melt 4 ounces of good quality dark chocolate. Place melted chocolate in a small mug. Have a styrofoam surface ready to serve as a chocolate drying station. Dip frozen avocado popsicle into melted chocolate. Stand popsicle upright on styrofoam board for chocolate to dry. It should only take a minute. Serve immediately or place chocolate avocado popsicles back in the freezer. Asides from dipping popsicle into chocolate, you can also drizzle the melted chocolate for a different effect. If you like ice cream, you’ll definitely enjoy how creamy and decadent these avocado popsicles are. I can’t wait to share these treats with my dad. I’m sure he’ll be reminded of all those mornings long ago when the two of us would sit at the kitchen island and share our breakfast avocados. Pour mixture into popsicle molds until almost full. Place a layer of foil over the popsicle mold, followed by the popsicle mold cover. Insert wooden sticks into the mold and then remove the popsicle mold cover, leaving only the foil. Over a double boiler (bain-marie), melt chopped chocolate until smooth. Alternatively, you can microwave it at half power in 30 second intervals until melted. Be careful not to overheat and burn the chocolate. 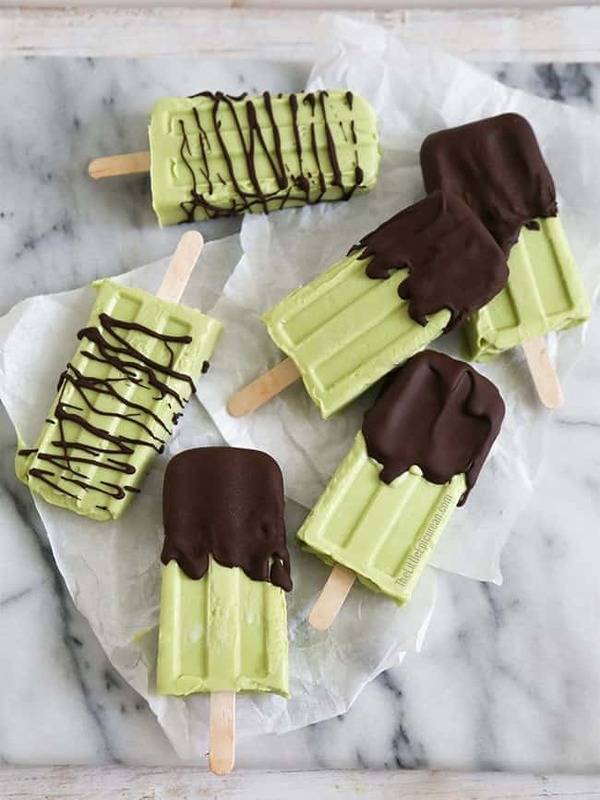 Dip frozen avocado popsicles in melted chocolate. You can also drizzle melted chocolate over popsicles. * Pureed mixture will be quite thick. Add more liquid to thin it out. * I used 72% dark chocolate. 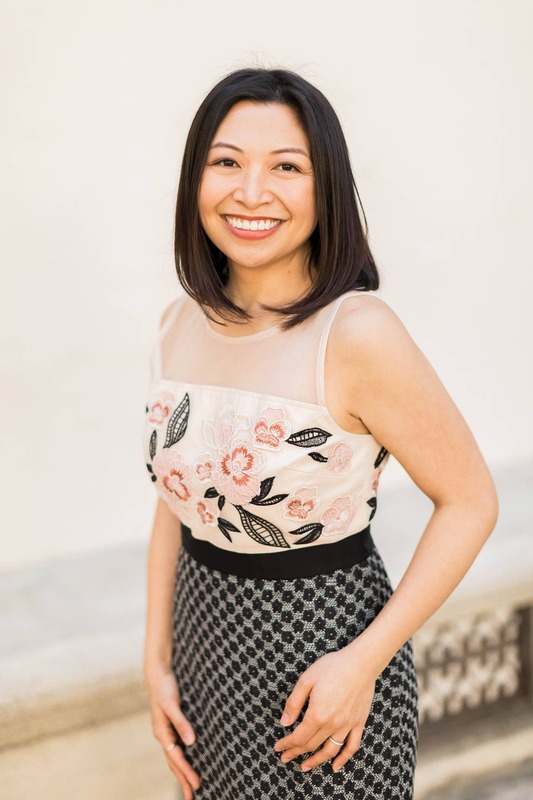 What a fun story! I have a similar one that involves putting sugar on grits. I want a popsicle for breakfast after seeing this! I need to go buy popsicle molds. I love this concept! I’ll alter out the milk with non-dairy things :( but it sounds delish! I also had a similar realization when my coworkers were appalled at the thought of butter on oatmeal… Is that a west coast thing or just my family? Hi Abby! I thought about making it with soy milk but I was out at the time. A Dutchie acquaintance cringed when I told her we enjoy avocado cold and drizzled with sweet milk– disgusting, she even said. Boy, is her closed-minded non-adventurous self missing out! The pops looks awesomely yummy, Maryanne! But I’m sure sitting down and enjoying them with your dad and mum will make ’em even more delicious. Wow. Another, unique, great recipe. I really enjoy your blog. Thanks for sharing. 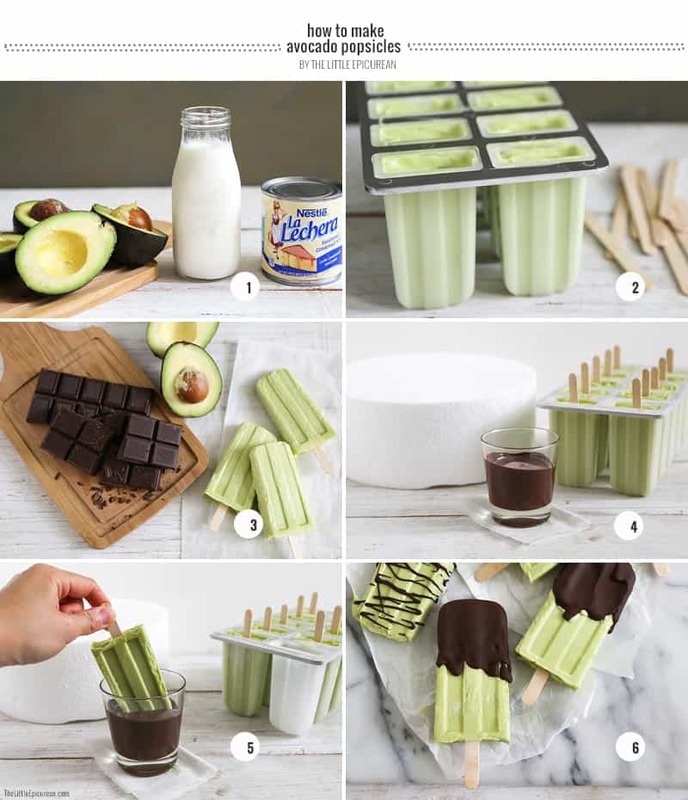 Avocados aren’t at the top of my list of “fruits to make into Popsicles”, but when you add condensed milk and dip it in chocolate, it’s a whole different story. Thanks for the post! I LOVE avacodos but have never heard of them this way. They look amazing and I will definitely try them! The story reminded me of me telling my friend yesterday that we would lick (so it sticks) then salt the stalks of rhubarb growing fresh in our garden and eat them as kids. Most people I guess only sugar rhubarb. AND occasionally I crave a sandwich that my dad wouid make me as a little girl – bananas sliced thin on bread spread on one side with peanut butter, on the other with real mayonaise and sprinkled with cinnamon. Sounds disgusting I know, but try it – it is really yummy I promise. Oh my gosh these look incredible!! Could you tell me please where you got the molds from?? I’ve been looking for a classic-style mold like this for a while and can’t find them anywhere! I’m from the UK, so I’m really hoping I can get my hands on some! Hi Maryanne I’m going to try the Chocolate Avocado Popsicles with coconut milk. So half milk, half coconut milk and essence. My mom always made these growing up! I love the chocolate drizzle/dip idea! any idea where I can find a popsicle mold like the one you have used. I want this style but Im not having any luck locating.I cant wait to make these. what a great alternative use for avocados!!! This looks delicious! I like avocados in my smoothies so I know this will be good. Thanks for sharing. I found this via henryhappened Popsicle post. These look yummy! They remind me of mint-chocolate chip ice cream. I wonder how some fresh mint would do in there?! Mmm I made these today and they turned out delicious. Thank you for the great recipe! I’m from the Philippines, and to us, Avocados are meant to be eaten with condensed milk (condensada) and am surprised to learn (via buzzfeed) that a part of the world is appalled by this. We’ll they’re missing out haha. I’m gonna try this later for my kid. It’s sizzling hot this April, here in Manila. I like your idea of covering the mold with foil, popsicle cover, and then insert the stick. I have read many reviews that complaining about the plastic popsicle cover breaks easily. I think your way, using the cover as a guide and without freeze it is absolutely genius! Thanks for sharing the details of how to make the popsicles!